"Traveling With a Loved One with Special Needs and a Service Animal"
I LOVE Walt Disney World!! I try to go at least once maybe twice a year if possible. People always ask me why I love it there….Really?! Well my first and most important reason is because Sam LOVES it there!! 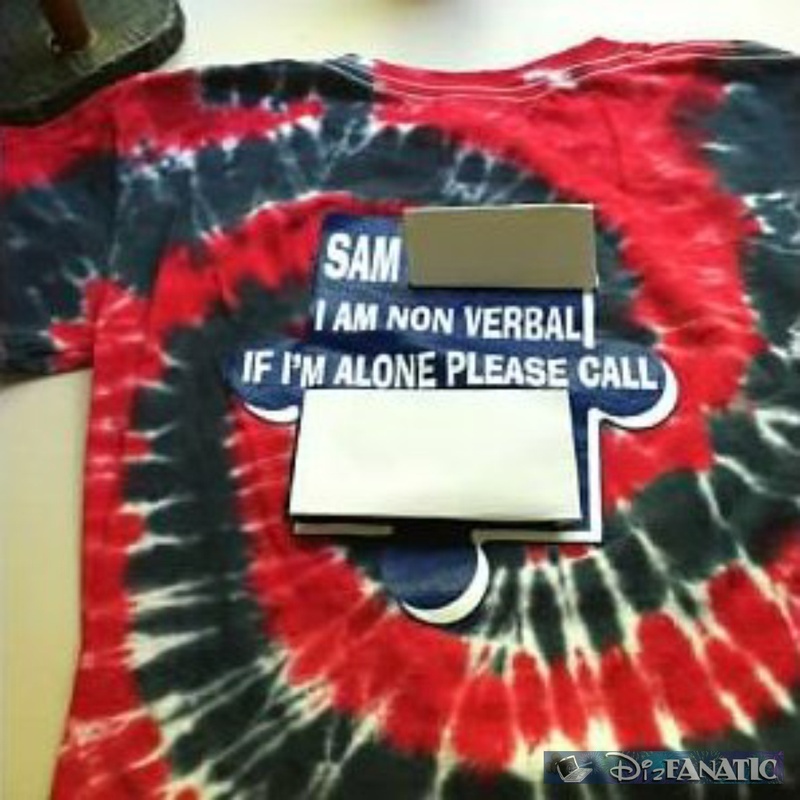 Sam has Autism and Apraxia and is nonverbal. Sam has never had anything come easy to him. He struggles every day of his life. People are always judging him, staring at him and talking about him like he can’t hear. I fight very hard to shield him of this and raise Autism Awareness. But when we are at Disney Word Sam gets treated like a king!! It is the one place where Sam has it a little easier. Nobody judges him there and the Cast Members (Disney Employees) always go out of their way to make Sam happy. When we first get to Disney World and hop on the Disney bus Sam’s face lights up and he gets the hugest smile on his face. Wouldn’t any parent love that?? Behind that face is my other 4 boys smiling faces!! People are always asking me questions about Disney World so I figured I would write a blog about some of my tips. 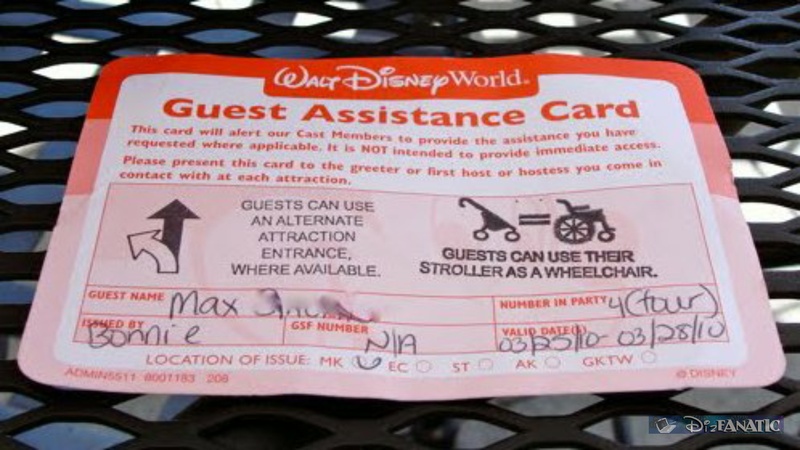 The Guest Assistance Card – how to get it and how it helps. If you or a loved one as any type of Disability or Special needs you can get a Guest Assistance Card (GAC). You can get them at any of the four parks. All you need to do is go to the Guest Relations office which is always located near the entrance. You need to have the person that has the disability with you when you go. You need to tell the Cast Member what it is you need assistance with. For Sam we always say that he has Autism and can’t wait in lines for very long and he also has a very hard time in crowds. We also have Hagrid, my sons Autism Service Dog so we ask that they be kept together whenever possible. Back before we had Hagrid we used Sam’s stroller as his “safe place”. You can request from them to use your stroller as a wheelchair. They will give you a red sticker with a picture of a wheelchair to put on the handle of your stroller. This helped us a ton! We used to be able to keep Sam in it right up until the ride if he was having a hard time and we knew he wouldn’t make the walk. It also was very helpful during shows. They would let him stay in it and one of us could stay next to him. If it was crowded they would make the rest of us sit a few rows back but if it wasn’t crowded then we could all sit together. So for Sam’s card it would have the stroller and a wheelchair stamp and use alternate entrance stamped on it. They will ask you how long you are staying for and mark it on the card. They will also ask how many are in your party and they will write that on their too. They will not ask for a doctor’s note or any proof of the disability. 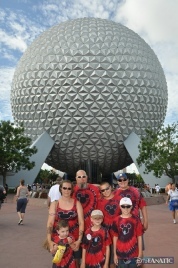 Without the GAC card we could NEVER go to Disney World. How does it help us besides the wheelchair use? Well whenever you get to a ride that the holder of the card is going on you show the Cast Member the card. Most of the time they will send you in the Fast Pass lane or send you in the handicapped entrance if there is one. Your wait time is MUCH shorter than waiting in the regular line. Should you feel guilty for bypassing that hour long wait and getting on the ride in 10 -15 minutes instead?? HECK NO!!! If you or your loved one doesn’t have the capability of waiting in a line without having a meltdown this is the only way you and your family can enjoy the parks. I know for me I feel like Sam struggles so much in his everyday life that this is HIS time to be happy and the GAC enables him to do that. There are sometimes people who give us “the look” I call it when we are passing by. One time I stopped and told a Mom that we could gladly trade places and I will stand in line with all my typical kids for an hour and her child can have Autism and get on a bit quicker – I wouldn’t mind that deal at all. Plus I am doing these people a favor because I am pretty sure they wouldn’t want to be in any line with Sam while he is having a meltdown!! Some of the Disney Cast Members at certain rides ,I noticed our last trip, may still try to get you to wait in the regular line if the wait for it is under 20 minutes. If you think your child can wait then fine but if not then speak up. Sam really wanted to ride Aladdin’s Carpet ride last November but he was in a terrible terrible mood. We were trying to walk right past it but he starting crying and pulling us towards the ride. The Cast Member told me we had to wait in the line and it was only 20 minutes. I told her he really wants to ride it but at this time there is no way he can wait 20 minutes. She then told us to go through the Exit and we could get on next. So don’t be afraid to ask, just don’t be rude about it. Speaking of Rides – We always try to have a plan of how we want to tour the parks. We see some people wandering around aimlessly and I prefer not to be one of them!! I also like to research the rides before going if we haven’t been on it before. ** TIP** Sometimes if you have special needs child/Adult or someone who is afraid of rides you can watch many of them on You Tube. I often do this with Sam so he will get excited about riding a ride. It will also give you an idea if you think your family would enjoy the ride. You can also usually preorder maps before your trip so you can get an idea of where you want to start. Disney has recently started new called FastPass+. You can reserve a rides in advance before leaving for your trip. I have yet to try the FastPass plus as it wasn't an option the last time we went. The GAC card is also good for shows. If you show them the card many times they will let you sit in the handicapped section. For fireworks we have never used it. I heard there is a tiny area that you can use it but they only allow the GAC card holder and one other person and you need to be there really early to get to it, which for us defeats the purpose. 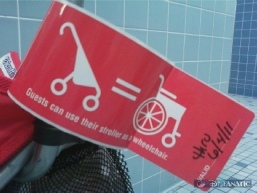 A tip about the stroller as a wheelchair – even if you think you won’t use it as one go ahead and get the sticker anyway. You may change your mind after a long day or if little Jimmy is having a meltdown and is refusing to walk. *TIP* It is also very helpful if you go to Disney Quest in Downtown Disney. They do not let strollers inside at all but if you have the sticker they will allow you to bring it in. Example of GAC card. Example of sticker for your stroller. At most character spots the GAC card will not help. It doesn’t hurt to ask though. Some do have Fastpass. Some places, like the Character spot in Epcot, the GAC DOES work and you can get to them a little faster. The characters can be a stressful time for us. It has happened to us many times where we try to wait in line to meet them and my husband will sit off to the side with Sam until it is our turn. It will get close to our turn then we find out the Character will be taking a 10 minutes break. If I think Sam can wait then we will or most times we will get off line. I try to set up a few character meals. I love doing it this way so we don’t have to wait in line to see them. Of course there are only certain characters at the meals so if you are looking for a specific character then you may have to wait in the park to meet them. 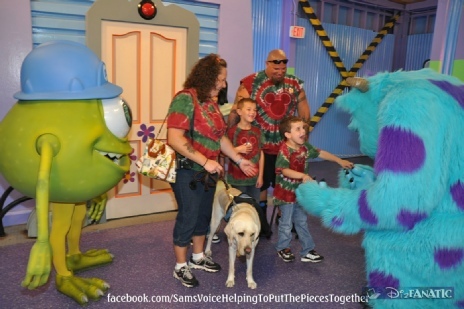 Sam LOVED meeting Sully and Mike! Ok so here is where my style may differ from yours. 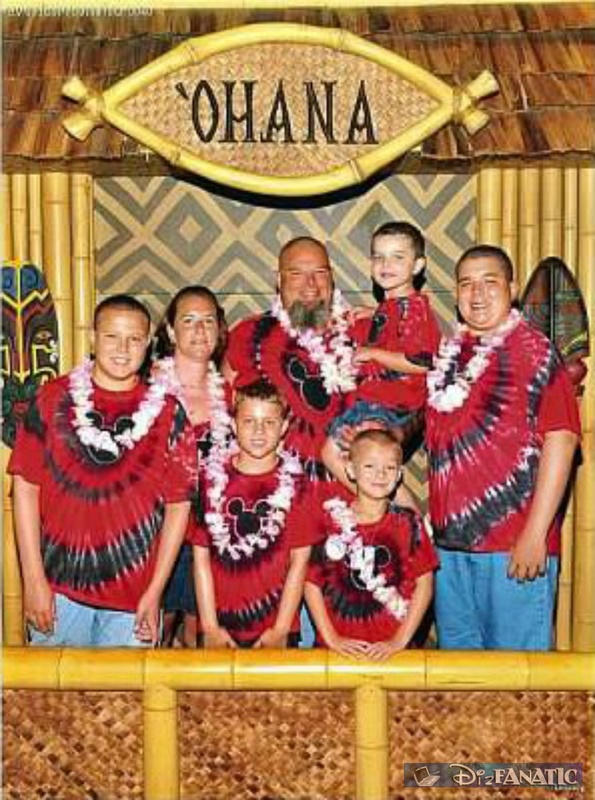 For us we like to stay onsite in one of the Disney Resorts. We have stayed in many different resorts on different levels but our favorite is the Wilderness Lodge. (Diz agrees) For us hopping on the boat and being in Magic Kingdom in 5 minutes is priceless!! For the other parks we hop on the Disney bus. They run early and late and we have never had an issue getting anywhere. If we drive to Disney we usually pull in and don’t touch our car until we pull out to head home. If we fly we get to use the Magical Express. This is offered to all guests staying onsite. They will take your luggage right from the airport to your room, no need to wait at the baggage claim. If you need anything out of your bag right away or if it is later this may not be a good option for you – if that is the case just don’t put the special tag (provided by Disney) on your bag and you will have to pick it up at baggage claim. Then you hop on the Disney’s Magical Express bus and off you go to your resort. They will also pick you up and bring you back to the airport too. Garden Grocer - We use Garden Grocer to deliver groceries to us in our room. (Snacks, Bottle Water etc) You don't need to be there to get them. They will leave them with the front desk. The resort will make sure the frozen stuff stays frozen and the cold stuff stays cold! When you get back to your room just call the front desk and they will have them delivered to your room. We usually start our order a few weeks in advance. You can save it and add to it or remove things. I usually finalize it 2 weeks before I want them delivered. Delivery dates can fill up. We like to get up early well we don’t really have a choice as Sam wakes up around 4 am anyway. For me there is nothing like walking down Main Street before anyone else is in there. How do we do that? Well I like to plan many of our sit down meals in advance. We always have the dining plan and usually go when they are offering it for FREE!! Many Disney table restaurants you can make an Advance Reservation (ADR) 180 days before your check in date. If you are staying in a Disney Resort they will let you book 180 days and the following 10 days after as long as you have your resort confirmation number. You can book these through the Disney website, by calling them or if you use a travel agent they can do it for you. 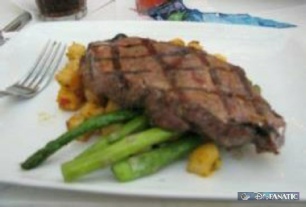 I always say with a little bit of planning you could be eating steaks instead of burgers and fries. So if Magic Kingdom opens at 9 the table restaurants will start at 8. We take the first ADR we can get which is usually 8am. Since the park isn’t open to the public yet you will need to go to the entrance for “Early ADR’s”. It is always a good idea to have your ADR confirmation number on you. There have been times where our name wasn’t on their list at the gate but our number was. I am telling you walking up Main Street alone is awesome!! We also get some of our best pictures at this time because there is nobody in the way!! The PhotoPass photographers are all out at this time too and there aren’t any lines so you won’t feel rushed at all. I highly recommend doing this if you can get up and out early. Then at 9 when the park opens we are already in. I also refer to Magic Kingdom the most because that is Sam’s favorite park but we usually go early to all of them. I recommend Tusker House in Animal Kingdom for an early breakfast too. We like to plan out several of our meals. I am not a fan of Quick Service dining. It is good sometimes but I hate hunting for a table for my large family and Service Dog. I like to know we will get an air conditioned break and be able to sit and recharge for a bit. It’s good for Sam, Hagrid, me and everyone involved. I am working on my SamsVoice.org site and plan on adding a section about Disney food. Keep on the lookout for it! We love to pre order the PhotoPass + because it also includes many rides and restaurant pictures. We used to buy the regular CD then still buy our rides pictures at Tower of Terror, Space Ranger Spin etc….and at certain restaurants. I like this one much better!! I usually order it a month in advance. They will send you a voucher in the mail. DO NOT LOSE THIS!! I keep it will all of my important vacation papers. When you get to a park you can ask where to redeem it. They will give you a plastic card that you will hand to all of the photographers to have your picture taken. **** TIP**** Take a good picture of the back of the card where the number is. This way in case you lose your card you will still have the number. The number is how you retrieve all of your photos on the PhotoPass website. the things you can add to your pictures on the PhotoPass website. Stop at every photographer you wish and have them take pictures. It’s also nice when you preorder because taking a picture with a child with Autism can be quite the task!! Since we prepaid they will snap away often getting the perfect shot in the end. Once your vacation is over you can log onto the Disney Photo Pass site and enter your card number. It will pull up all of your pictures that they took. You can add cool Disney borders and other cute things they have on their. 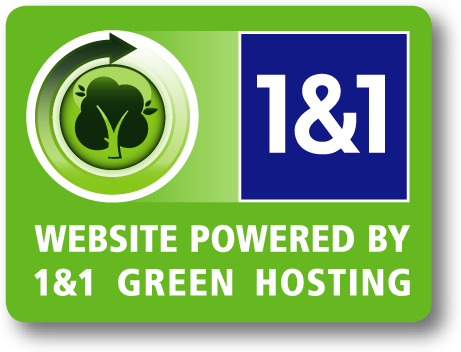 You will have 30 days from when you log on to finalize your pictures and have them sent to you on CD. You have the release to them so you can then take them anywhere to get printed. Nobody plans on losing their child anytime anywhere but sometimes it does happen. It is better to have a plan just in case this does. This could vary depending on your child. For my older kids (17 & 15) it isn’t that much of an issue anymore as they have their own cell phones, they know our numbers and are old enough to maneuver through the parks alone if needed. First thing we do is designated a meeting place just in case we do get separated. For our younger kids (8-12) we tell them our meeting place but tell them to go to the nearest Cast Member and tell them they are lost and where we are supposed to meet up. Now my boys this age do know our phone number but you never know if they will panic so I also have ID’s made for them that they wear with their name and our cell phones number. Now for Sam, my boy with Autism this is an entirely different situation. 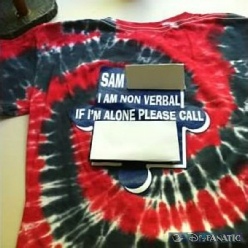 Sam is nonverbal and refuses to wear ID. Before we had Hagrid we were so very nervous about him running off from us and not being able to tell anyone who he is or that he has Autism. We had special shirts made up for him. I went to the Disney store and ordered several Disney T-shirts. Then I took them to our local screen printing shop in town. I had them put an Autism Puzzle piece on the back and our info. It said that his name is Sam and he is nonverbal if you see him alone please call our number. There are a ton of IDs out there for kids it just depends on what you think your child would keep on. Example of the back of the shirts we had made. Are you Celebrating anything special in Disney? I f you are make sure to tell them when you book your trip and also when you make your ADR's. some places will give you a Birthday cupcake. There are also other things you can do. When we celebrated my son's 7th Birthday I had ordered him a special cake through the cake hotline. 407-827-2253 You can order a generic cake or ask them to make you something special. 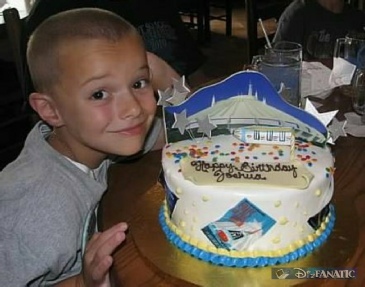 I had this cake made because it is my sons favorite ride. I had it delivered to our dinner reservation at Liberty Tree Tavern. 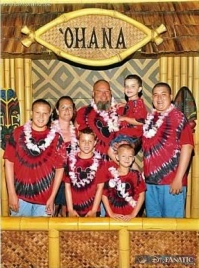 http://www.disneyflorist.com/ and http://www.memoriesbybetsy.com/mbb/index.php. Both were great! 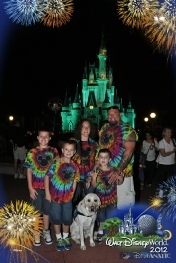 Our last trip with our sons Service dog was by far our best trip EVER!! Disney really does an amazing job making us feel welcomed with Hagrid. When you go into the park I recommend getting a Park Map for guest with Disabilities. On this map you will be able to see where the dog relief areas are. I would look for them before you need to use them. We never had an issue finding one but sometimes we needed help from a Cast Member. I was told they used to be “Backstage” so a CM used to have to take you to the area but that isn’t the case anymore which surprised me because most of the spots are out in the open. They can be hard to find though. They are VERY small and sometimes there is a little sign and sometimes the signs are missing. At first the size bothered me but when I thought about it Hagrid is trained to go on command anywhere I tell him too. He doesn’t need a big grassy area so I guess the size really wasn’t an issue. But I hated having to hear “Eww look at that do going pee over there.” There was also one relief spot in MK that was right next to a little shopping kart. This poor guy is trying to sell pins while my dog is 6 inches away doing his business. I suggested that maybe they put up a little fence or something just so other people don’t watch. But we never really had any issues finding or using them. 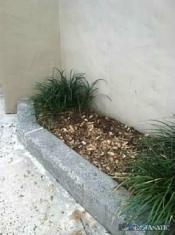 Here is one of the relief spots in Hollywood Studios. 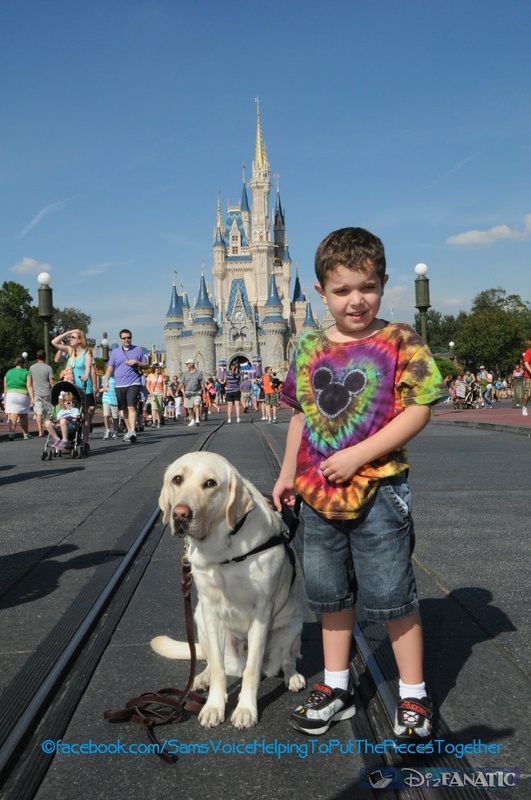 There are many rides that they will allow the Service Dog on. Our son and dog are tethered together. We found it best to untether them before getting on the ride. It made life easier when it was time to get off of the ride. The first time we rode Haunted Mansion while they were tethered. It was quite the sight watching me getting Hagrid to turn around in the doom buggy – having me get off then Hagrid pulling Sam off. Lol. A member of the party must remain with the animal at all times. Here is more info from the Disney Website – unless if they changed it since we last went which they may have the relief info on the Disney site was wrong. Always check when you first arrive what the rules are. The Heat!! If the ground is hot make sure your dog doesn’t burn his paws and give them plenty of water! I also carry a little bag of dog food with me just in case we don’t get back to the room in time for his meal. I always also carry my own collapsible bowls to carry in the park and to use in the room. Make sure you pick up after your dog and carry extra baggies on you just in case. Pay attention to your dog. We found that when Sam was becoming tired, so was Hagrid. It’s bad trying to drag out your special needs child when they have had enough but it is even more challenging to do it with a 70 pound tired dog in tow! During Parades claim your spot and make a barrier around your dog. People get nutty at parade time and some will do anything to inch in front of you. Most people aren’t expecting a dog to be laying there and will step on them. We tried to stand around Hagrid to avoid this from happening. Be prepared for everyone to ask to pet your dog. It’s hard to say No to kids but here if you let one there will be hundreds by you. We learned very quickly to say No quickly because he is working. Sometimes when it was really hot and we were taking a break by the pool at the resort we would give Hagrid a break too. Instead of making him sit in the heat and watch Sam in the pool that he isn’t allowed to go in we would let him stay in the room to cool off and rest. If for any reason you ever leave your dog in the room put up the Do Not Disturb sign on your door. The last thing you want if for a Mousekeeper to walk into your room to clean it or for whatever reason and be startled by a dog. Most of all ENJOY YOUR TRIP! !